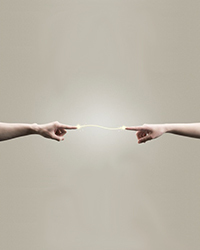 Teleconnections are related climate anomalies that happen far apart from each other. The effect of a teleconnection can be felt at a distance from where the initial event occurred. We all have moments when we wish we could be in at least two places at once. Climate models have that power, but it often comes at a hefty price. Researchers from Pacific Northwest National Laboratory, working with a colleague at Cornell University, borrowed a technique from engineering to efficiently discover distant input-output relationships in climate models. The scientists introduced a technique new to climate science in which these relationships—across different timescales—can be described at the same time in one simulation. By asking more focused input questions of climate models, researchers can get more information out of them with fewer simulations. The technique promises to save time and money in computing resources. Why It Matters: Using a climate model, scientists run a possible scenario through to project future change. Most current climate modeling approaches can only adjust one variable at a time and only show long-term changes. However, teleconnections—related but physically distant climate anomalies—have varied timescales over which different responses occur. The new technique shows promise by zeroing in on teleconnections in ways that other modeling methods have not. Methods: Researchers introduced a technique that involves multiple small changes of an input field while continually monitoring output fields to see how the model responds to the input adjustments. Modelers can identify different timescales of climate response to forcing—a change in the Earth's energy balance—without pushing the climate too far from its initial state. 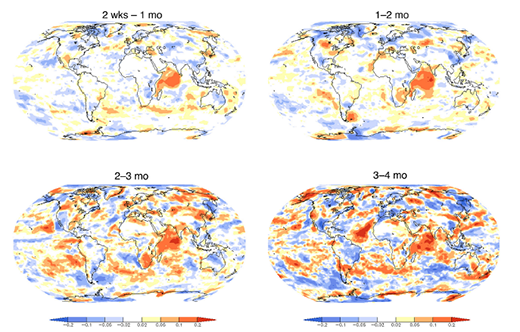 During a global climate modeling run, low cloud cover response to a 1-degree Celsius warming in the northwest Indian Ocean reveals itself in intriguing ways. Different parts of the globe respond on various timescales. Researchers used this technique to determine the steady-state, or equilibrium, responses of low cloud cover and latent heat flux (the heat given off when liquid water converts to vapor) to heating changes over 22 regions spanning the Earth's oceans. The new method described the responses for those regions at the same time. Meanwhile, the findings showed similarities between the response characteristics and those of step-change simulations, which often feature sudden changes to the input field. With this technique, researchers can estimate the timescale over which the steady-state response appears. What's Next? The new method could be useful for building descriptions of teleconnections and uncertainty quantification to identify the effects of fine-tuning climate model inputs. Sponsors: The Department of Energy's Office of Science, Biological and Environmental Research supported this research as part of the Regional and Global Climate Modeling program, as a contribution to the High-Latitude Application and Testing of Global and Regional Climate Models (HiLAT) project. In one sentence: Borrowing a technique from engineering, PNNL researchers defined input-output relationships across different timescales at the same time in one climate model simulation.